A Best Practices & Education monthly meeting of North Central Washington Beekeepers Assoc. Was held on March 17th 2019. Craig Dunning gave a talk on how package bees came to be a “Thing” and the pros and cons of packages and Nucs. Thiago Moraes gave a talk and a slide presentation on his set up and his first year of beekeeping. IS mite treatment used? Supplemental feeding yes/no? General geographical location and Elevation. Please note**** our April BPE meeting will be held on 28th this month NOT 21st. Due to 21st being Easter sunday. Bee chat is to be held on April 11th at 6pm at the Countryboys BBQ in Cashmere. DATES: Bee Chat, Thursday 14 March at Sweetwood BBQ. Wenatchee. 6pm. Next BPE Sunday March 17th 2019. Douglas Co. Firehall. Bee Order Deadline March 27th.!! 31 people in attendance and 2/3rds were new members. !! This is great!! Wayne introduced his daughter Bridgette Ranne, As guest speaker, she is a botanist with the forest service, she gave us a very informative talk on native forage , and what blooms when & where. After a short break we discussed our mission as beekeepers in the NCWBA as we had so many new people attending. Wayne discussed our Education program, and Peter & Daryns Pybus Event. We are going to do the first NCW colony census, later on to assess where and how many colonies survived the winter. Al had a Question and Answer session for new keepers. Wayne handed out previous years Beginners Certificates That we were given the weekend of the Pacific NW Bee Conference. In Attendance 25, members including 4 new members. Wayne Ranne, Kristen Taylor, Daryn Klinginsmith, Teri McGarr. Ben Erdmann, Tyler Armour, Christine Young and Breanna Gask Wilson. We Voted on our Board members, it will remain the same, but Daryn is stepping down as treasurer and Peter Hill will take his place. Wayne talked about our new Beekeeping mission, ( What we are going to do) for 2019. We aim to educate not only existing members but the public also, we are aiming for 80% overwintering of colonies, and will be calling our monthly meeting, "Best Practices Education" or B.P.E. 0 years experience beekeeping, WASBA Beginners taught by Al. Z. this will be taking place the first 3 Saturdays in February at the firehall, from 8 am til noon. Anyone interested please let Al Z, Know. the cost is $25 . 1 year Experience, WASBA Apprentice course, taught by Steve Foley. 3 years experience, WASBA Journeyman course. 5 years Experience, WASBA Master Beekeepers Course. Details of the last 2 are still to be finalized. Mentorship was stressed, we need to be helping each other and especially new members. Al Zalewski took the floor and gave a presentation which benefitted the new members, he also asked for people to step up and help him with the Education, he is only one man, we need people who will and can help him out by doing Educational part of our meetings. Daryn Klinginsmith & Peter Hill, will be teaching a class Titled "Whats the Buzz"
Daryn refunded monies to the people who did not attend the mead class. and took checks given for memberships and the mead class. Al. Zaleweski brought a beautiful book Titled Honey Bee Biology, byDewey M.Caron, and Lawrence Connor. Lee McGarr brought some ideas for wooden nucs, one a kit he designed himself and one a twin nuc, both of which he sells. Next BPE meeting. February 17th. Board members present, Wayne Ranne, Kristen Taylor, Daryn Klingensmith, Teri McGarr. next Wayne introduced Al, who told us about a seminar he went to in Spokane on Saturday, he told us it was quite interesting , there were A lot of very good speakers and they plan to do it every year, he said it was well worth the $50. he has offered to look into the Beginners beekeeping program from WASBA and says he feels we need to transmit social responsibility to hobbyists, he also asked if there was anyone interested in the journeyman class, and a few raised said they were, the new curriculum is almost ready, he will speak to Steve Foley about it. He then showed us a TO DO LIST, which is going to be part of our new website. also said he'd found 'NOTE' on his computer was a pretty good way to keep track of hives. Daryn gave the treasurers report, we have $5372. in our accounts, 0 new members this last month , but around 10 in total in the last 6 months , He says he was approached by Pybus university, to do a beekeeping seminar, possibly in Jan.
Jeff and Steve will be doing the mead class again this year, more will be posted about that . tentatively set for Jan 12. Wayne asked Lee McGarr to take the floor and tell the club about products and services that Wenatchee Valley Bee & Supply has to offer, woodenware, mite treatments, advice and mentoring are among them. Lee has a list for a bulk order if anyone wants to order, it will not be an order like we are used to, in as much as orders will be individually sorted and then the person will be called when it is ready. he also stresses anything in the catalog can be ordered, it just may take a few days. anyone interested can contact him through the group. Afterwards we sampled some lovely honeys, Al even brought one that came from Isreal. Well Done to all!! and Thanks to Wayne & Janice for supplying breadsticks and crackers. Bee Chat on Dec 13 TBA . **Note NO DEC business Education meeting. Our next Business Education meeting is Jan 20th 2019. Also I have renewed our use of The Douglas co. Firehall for the next year. Wayne opened the meeting by introducing the panel for the Education part of the meeting. The panel consisted of: Craig Genereux, Craig Dunning, Thiago Morales, Lee Madden, And Al Zalleweski. The subject was a project they are working on , "2019 Queen Rearing Project" Craig D started out by telling us what they were planning to do and how they hoped it would mean local queens would be available for the club and local beekeepers, They covered their own reasons for getting into the project and advantages and disadvantages, of different methods of raising Queens, a very interesting talk indeed!! The new Facebook page is up and running, and will have several people manning it eventually. 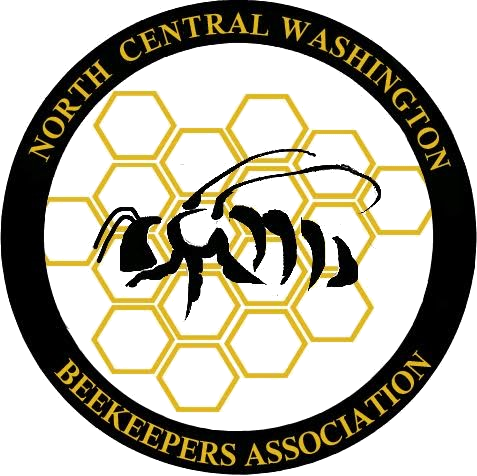 those people have not been named as yet, The address is North Central Washington Beekeepers Association. We are working on The new website, The plan is to transition over to the new website when the subscription runs out on the current one. Daryn gave Wayne 2 keys for the box. Wayne will have one & The Secretary has one, A rota will be organized for pick ups. We have a guest speaker coming next month, Tim Hiatt , who will be here to speak to us about the Washington state Beekeepers Assoc. he will be available for questions afterwards. The Next Bee Chat will be on 11/08 at El Agave , 800 N Wenatchee Ave.
Next business & Education meeting 11/18 5pm at Douglas Co. Fire Dept. I Apologize and will get last months minutes up ASAP. I am sorry for the delay. Teri. Present .Wayne Ranne , Kristen Taylor, Daryn Klinginsmith, Teri McGarr. Wayne opened the meeting . he explained hed like to start doing the Education section of the meeting up front, then get down to business. Kristen took the floor to tell us about the trip she took to Boise to the apiculture soc. there were around 150 people attending the seminar and next year it will be held in Oregon. Wayne says he has a recipe using apple cider vinegar for bee health, that he will share. Glenn Copeland took to the floor to discuss the website and new ideas. Wayne discussed the possibility of using a separate email address for members wanting to sell things. Daryn gave the treasurers report, and mentioned we get 2-3 new members a month. Wayne passed a paper around asking people to volunteer for an IT group. Walt Kursave took the floor to discuss the slots still needing filled for the fair. Wayne has volunteered his observation hive for the fair. The club needs to buy a microphone for our presentations, Al moved we should go ahead and buy it, and the motion was passed. we also discussed the possibility of buying our own camera as a club, Glenn said hed look into this. Oct.21 Biz /Ed monthly meeting. I'd like to take a moment to give you all My Sincere apologies for the tardiness of these minutes. and to thank you for being patient. Teri. minutes of July 22nd meeting. August 4 - Annual Potluck/BBQ @ Walla Walla Point Park, stand #2, 5-9pm. Aug 19-next Business & Education meeting. Daryn took the floor and read the treasurers report, as of last month we had 5 new members, he encouraged members to attend bee chats. In our 3 accounts (checking , saving and paypal) we have $4751.78, $1132.06 and $19.12. he discussed starting a mentorship program, as hes had several people contact him looking for help. we discussed the best way to start one. Lee talked about the potluck which is coming up quickly. he said Patti will be bringing a Traeger grill and we may buy a grill aswell. Kristin asked if anyone was interested in doing the farmers market in Levenworth, there seems to be some differing versions of conversations with different people who are in charge of the farmers market, seemingly you can sell your honey there , apparently there are discrepancies as to wether it costs to do so. Walt discussed the fair & how many slots he has left, He still could use some help both with time slots and with setting up and taking down our display. Al spoke briefly to answer a few questions about honey and about mites and the best times to treat. Craig Genereux how he treats for mites in August using Oxalic acid. Peter Hill took the floor and told us about his and Steve Olsens trip to WSU to do the queen rearing class , Chris had a prior engagement and sent his apologies. peter covered quite a bit of material on the class, including artificial insemination of the queen, grafting, and he brought a sample of empty cells he had produced, he showed us a special frame for queen rearing and a special bpoard called a Cloake board. we also discussed banking queens and the possibility of a group within the club producing queens for the club. Al says he will have some year old queens available possibly this week if anyone needs one please contact him through Googlegroup. Al Zaleweski gave a very informative program on the control of varroa mites. "Control varroa or buy bees" this will be posted as a link and will be able to be seen on you tube soon. Vern videoed the whole Education part of the meeting , well Done to Vern. afterwards Daryn took the front and gave the treasurers report; $4,600 in checking account, $1132 in the Education fund, and $67. in new memberships this month. we have had 3 new members this month. We discussed having a Temporary president & Vice President, and asked if there were any volunteers for vice president, Kristin Taylor raised her hand, she was the only hand raised and was voted in, we then asked for president , Wayne Ranne raised his hand , and was voted in. we have a guest coming next month from the state legislature.Wayne asked if we use club funds to pay people to come and speak.Pete Hill mentioned that the people he'd spoken to as WSU at the queen rearing class had said that they didn't have a budget for travel and overnight accommodation etc. maybe we would be willing to pay travel expenses for someone to come talk to us. Al and Stan Peak, both felt it would be a good idea to invite the public to sit in on a meeting, maybe do it in a public place, and Daryn suggested the new Pybus conference room. Alice had queried the idea of letting the public sit in on meetings, as she felt it wouldn't be right that members are paying dues and the public wouldn't be. Steve and Pete will tell us about their trip to the Queen rearing class, next month, it sounds like they learned a lot and had a good time too. Walt Kursave is heading the Chelan co. Fair this year and he asked if anyone had received his Emails as he'd had little to no response. Please, if you have a few hours to spare, contact Walt and sign up for the fair, its fun, & its easy ,Walt will get passes for whoever signs up to help out. this will be our ( Lee and I) 3rd year , we enjoy it every time.get out there and tell folks about the Bees!!! Wayne suggested we make a plan out for next year for the fair. and decide if we want to do it or not. all in all it was a good meeting, some great ideas came forward, and it was great to see so many there. lets go forward as a club and make these great ideas happen!!! our next bee chat is TBA. Lee McGarr would like to hear if you are coming so he can get food and drink organized. any amendments please let me know. May 20th Biz / Ed meeting. Daryn K. Teri Mc. present board members. Daryn opened the meeting with the treasurers report, $225. has been added to the club account due to new memberships. The need for the website was discussed, do we really need it can we not just use google group and facebook? Daryn pointed out that a lot of people use the website to pay their dues. 12 out of 16 voted to defeat the by laws, and 13 out of 16 voted a vote of "no confidence" in Jeff. and it was proposed that we ask for his resignation . Daryn then read the By law concerning termination. Alice asked that the minutes be posted on google group as well as the website, as that way people who do not use the website , could get the minutes. I agreed that I could do the minutes on both the website and in googlegroup. it was proposed that we need to vote on leadership at the next meeting, as we need to move forward, the common concensus was that there is too much politics and drama going on and we need to get back to beekeeping. Craig Dunning, Steve Olsen, Craig Genereux and Chris Church. the topic was "swarms", which was quite interesting. we had a new member introduce himself to the group, Lee Maiden. Walter said he had been in touch with Karen at Chelan co fair, and that she was going to get back to him with the booklet for the fair, & that Steve Foley has agreed to do the Honey extraction demo this year. Peter Hill & Steve Olsen have said that they will do a talk after the Queen rearing class next month. Al is asking for input for next months education, if anyone has any ideas please contact Al. *Aug 4th, 5pm -9pm Annual potluck & BBQ ,Walla Walla park stand #2. for information contact Lee McGarr. *Sept 6-9 Chelan co. fair, Please contact Walter Kursave for sign ups to man the booth. lastly I apologize if I have missed anything out as the meeting was rather irregular, Daryn had to leave after the vote and it left me as the only board member present. we have been given different rates for extra keys and still do not have a box. Lee McGarr said he would be apprentice webmaster, and will get together with Jeff to sort out the details. Kristen Taylor asked about storing the club equipment, and would someone be willing to get it and store it. Vern & Julie Smith said they would store it. Al did a very educational presentation on Nucs & Splits. very professional indeed! Al also asked if anyone was raising queens can they please let him know as there are a few people wanting them. Craig Genereoux said he would possibly have nucs and Queens soon. there was a 15 minute interval whilst equipment was transferred from members vehicles to other members vehicles. Wayne Ranne took the front to discuss his Team Based Organization concept. which seems a good idea and went over quite well. He also made the members who were there, aware that the Crillys had quit the club. and we needed to get The club equipment from Kriss.' house. The teams are to be led by captains, and are not to replace the board. which was voted in in January. Alice Crawford & Walt are going to head up the Chelan county fair outreach team. Al will continue to Head up Education. Daryn asked again for help for Jeff, Lee had already spoken to Jeff, but spoke up to say he would be willing to help. May bee chat is to be held at Kristalls in Levenworth at 6pm on May 10th. The Chelan co. fair is Sept 6-9th we need more people to sign up for a few hours. we have enough members this shouldn't be a problem. If I have I missed anything I apologize. Teri.